We can find nearly any opinion/evidence/support we are looking for to validate our ideals. I have made reference before about a game situation where my brother-in-law and I sat side by side watching the same play where a penalty was called. He cheered for my team’s rival. While I felt the ref had seen the play correctly, he was beside himself complaining about how unfair the call was. This was for me first hand evidence of how our persuasions lead us to see the same thing differently. I could find all the reasons the call was right while he objected by adding his perspective. 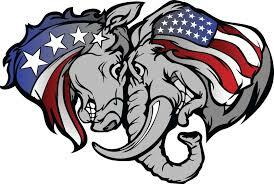 In this election cycle some are saying the Republicans may not survive as others suggest the strength will be shown through the silent majority. Regardless, it is my hope that we will be able to learn from the outcome. Trump has been called a populist candidate. Over the last 60 years Nixon and Reagan were populist candidates. They too rode the wave against the establishment as outsiders. Nixon was carried by the silent majority’s antagonism toward social disorder and Reagan “Stagflation” (Bush 41 won on coattails and Bush 43 is argued to have won through the Supreme Court). The term populist strikes me a little odd as populism means the people which is what we want– isn’t it?. This is how Republican candidates win elections; through a populist vote. Ok, suggest the Democrats receive a populist vote as well. My arguement is that Democrats have built-in constituencies who favor expanding government benefits and/or are targeted by perceived unfair treatment. Ask yourself why they really want open borders? Do ethnic minorities have targets on their backs along with other circumstances which favor voter blocs such as LGBTQ’s, Unions, and Women? There are other examples but these give you the idea. In any election, Democrats have a built in constituency which guarantees them an election if the “populist” voters don’t show. Democrats portray themselves as supporters of these blocs, but who are they really? Trump won the nomination over 16 other candidates; he has inspired astounding enthusiasm among the middle class. He has the Establishment along with the Democrats and Media suggesting he is anything but worthy, yet remains a viable option. I for one don’t want the Republicans to change who we are—democracy it is about the people—not the politian’s careers. This entry was posted in Business and tagged democrat party, populist, republican party, trump. Bookmark the permalink.